Naijasky.com/brass headquarters : town of Twon-Brass. ADD YOUR BUSINESS FREE TO YOUR LOCAL COUNCIL BUSINESS LISTING. Attract More New customers from: Local, State and Nationwide and Increase Your Sales. Interact with Your Customers. Add Your Business NOW! CLICK THE + SIGN when your council opens. 1. Insert your business name on Subject. 2. Add your business info on Message. 3. Click attachment to upload photos. 4. Click Post to add your business. Need Help contact Wale 08033181698. What are the major occupations in Bayelsa State? what are the main tourist attractions in Bayelsa Stae? How many main languages are in Bayelsa State? 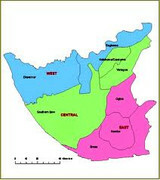 Bayelsa State was created when and by who?